Hollywood PI, sometime actor Eddie Collins is doing a bit on a sitcom when he receives an SOS from an A-list friend. Mike Ford's Oscar has been stolen during a home invasion and Ford's girlfriend has drowned in the swimming pool. Did she surprise the burglar? Whoever it was left behind threatening letters, and Eddie is hired to see if he can unearth their source. All the dots connect around a movie Ford directed and acted in several years earlier: Red Desert. More than a few people associated with that shoot recall it less than fondly. Is one of them harboring a deadly grudge? Eddie has hired Reggie, an old Army buddy, to do surveillance. Soon Reggie, Eddie's secretary Mavis, and everyone associated with Eddie Collins and Mike Ford seem to be targets. And smoke from the foothills is encroaching on Eddie's Hollywood home/office. Is Eddie's world about to go up in flames? 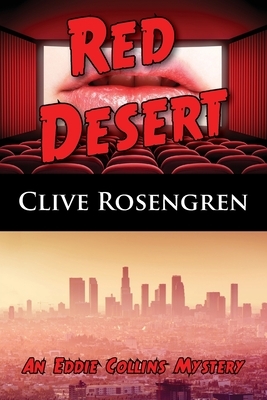 Originally published in 2015, Red Desert was a finalist for the Shamus Award. Book 2 in the Eddie Collins Mystery series.